If you’re in digital marketing, there’s no shortage of LinkedIn groups to cater to your interests. LinkedIn marketing groups are worthwhile because they offer news and insights curated by the best source of all – your peers. Here are the top LinkedIn groups you should follow as a marketing professional. The Content Marketing Institute (CMI) has become the authority in their space. So if you want well-curated insights on content marketing, wouldn’t it make sense to join the industry leader? CMI’s group is the place to share all things content marketing – questions, experiences, and knowledge. And with over 32K members strong, you know this group is popular in the industry. 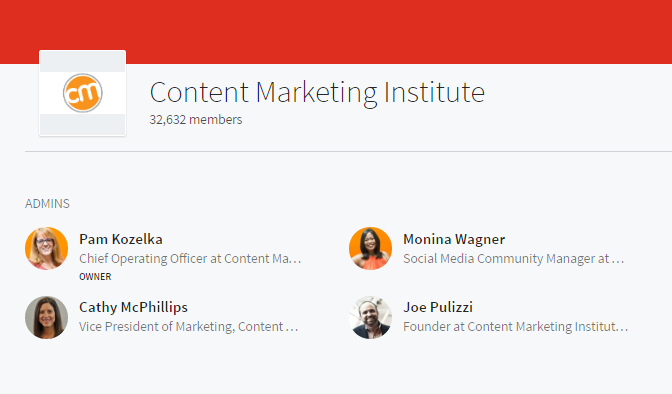 You’ll also see some of the top content marketing pros on the group’s admin panel. If you’re into content marketing, CMI’s LinkedIn group should be your first stop. Pro Tip: Groups that feature industry thought-leaders in their admin panel are always a good bet. An industry leader within the admin gives the group a certified stamp of approval for quality content. One of the largest LinkedIn marketing groups out there is Social Media Marketing. LOTS of fresh content on the topic. Another awesome feature of Social Media Marketing is how well-moderated the group is. A group hosting over 1.5 million members means spam can run rampant. But the group’s 48 professionals keep a close eye on forum content, making sure it stays focused and productive for its members. If you’re an advertising / marketing pro in social media and community management, check out Social Media Marketing’s LinkedIn group. Pro Tip: Large LinkedIn groups have their pros and cons. The pro is there’s a ton of fresh content for members to sink their teeth into. The con is that users may join these groups and try to take advantage of their member size for spammy purposes. When joining large groups like Social Media Marketing, look for group rules and anti-spam text. If you’re in the market for the latest and greatest on SEO, the Search Engine Land group has you covered. Search Engine Land has been an authority on the subject for some time. Like their site, the Search Engine Land group is a great spot for finding up-to-date industry trends and information. With a membership of over 77K search engine aficionados, Search Engine Land is the place to be for anything SEO. 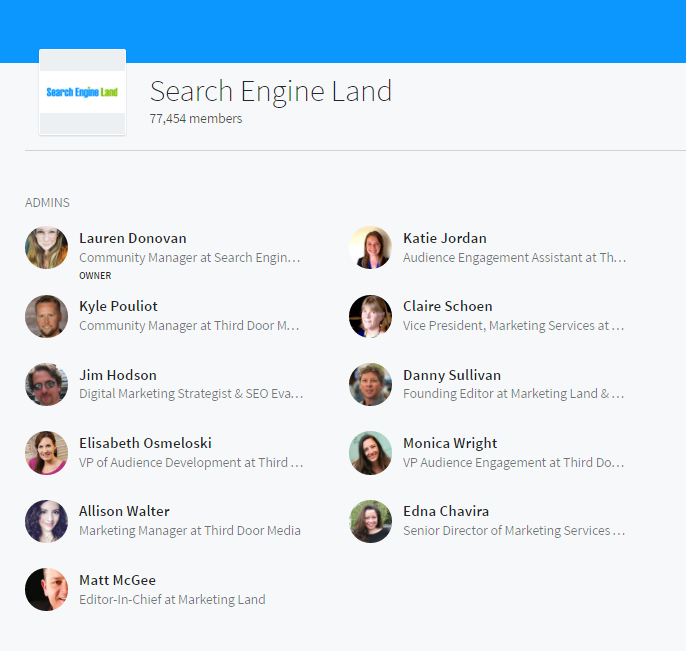 The group also has 11 admin members that make sure Search Engine Land is home to focused content. Check out Search Engine Land’s LinkedIn group to keep up with SEO news and trends. Pro Tip: LinkedIn marketing groups extending from an industry publication are a good choice for reliable content. Behind an industry publication’s strong status is it’s integrity. As an industry leading publication, you know they’ll uphold this integrity when it comes to their professional forum. The User Experience LinkedIn group was made for UX Pros to grow their network and gain insights into new trends and practices. User Experience brings all aspects of UX design to one group – from information architecture to user interface design, to human factor research. This group has it all. 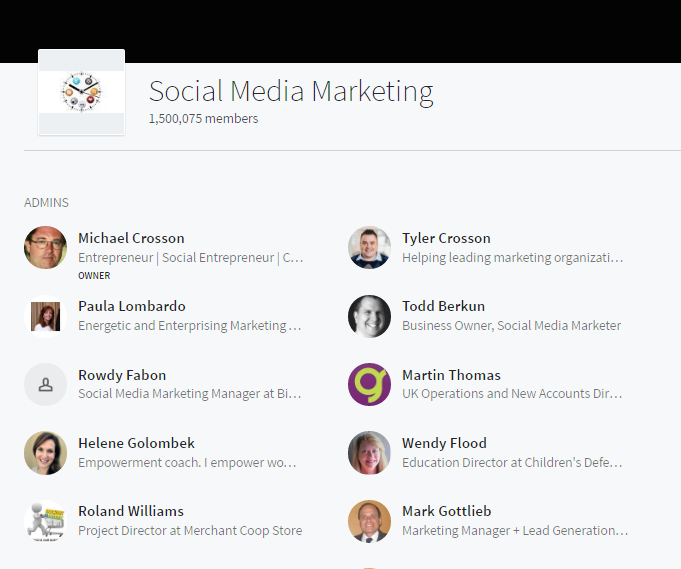 The LinkedIn marketing group is also well established with over 125K members and 10 dedicated admins, making User Experience the authority group in the field. 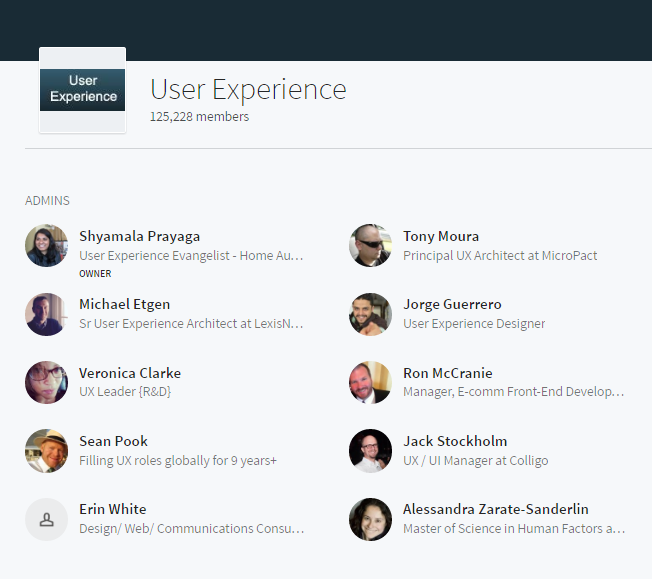 Get your fill of UX design knowledge and insights from the User Experience LinkedIn group. Pro Tip: A group featuring different disciplines under one common umbrella provides new perspectives helping you expand your knowledge as a professional. Content that’s closely related to your expertise can help you see your practice and techniques in a new light. 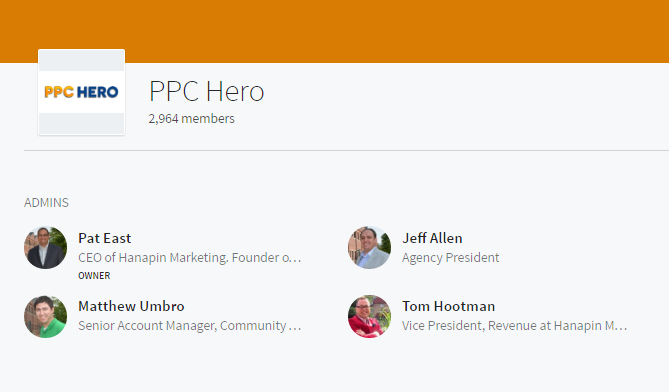 The PPC Hero group is your one-stop shop for all things PPC. There are a ton of LinkedIn marketing groups discussing PPC advertising, but few focusing solely on PPC management. Insights on the PPC Hero group range from 101 PPC techniques to advanced topics for seasoned vets. With a membership of 3K, this group is for PPC Pros at all levels. Join the PPC Hero LinkedIn Group to get insights on PPC strategy, landing page reviews, case studies, and industry news. Pro Tip: It can be tough finding niche LinkedIn groups catering to a specific interest. This is because they’re often smaller in size, and may be a few pages deep in the group explore pages. But keep your eyes peeled, and check out group bios to see which are dedicated to your niche. Now that you know which LinkedIn marketing groups are out there, request to join and offer your knowledge and expertise. With the recent launch of Pagezii’s LinkedIn Page, we want to take the opportunity to spotlight our favorite LinkedIn marketing groups. Give the Pagezii LinkedIn page a follow and stay up-to-date on the latest tips, tricks, hot shots and pro interviews from our blog.